Garden Office Pod - Who Has The Best Garden Office Pod? A high quality garden office pod is not only an ideal place to work in, it also adds a touch of style and elegance to your garden. They can involve a significant outlay, however, so it’s important to find the right one for you. Don’t worry, help is at hand with this WhatShed guide that will help you find your ideal garden office pod. Garden office pods are a niche, yet growing, market, so we were pleased to find five top quality examples worthy of a place within our league table. When deciding upon the rankings we’ve taken into consideration price and value for money, size, aesthetic value and much more. When creating this league table we also had to define what differentiated a garden office pod from a traditional glass fronted garden studio or office. A garden office pod, to our mind, is built with form as well as function in mind, so that it has to have a unique design of its own, often although not always featuring curved walls to create a pod effect. It also has to be made of superior quality components, so it’s not unusual to find them carrying high price tags as well. 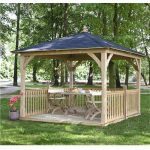 With this criteria in mind, we were pleased to find five examples that were worthy of inclusion in our league table, although the majority of the UK’s ten leading garden building retailers didn’t have any garden office pods on sale for us to consider. With five excellent models to choose from, selecting the overall champion was never going to be easy. 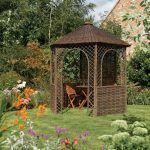 It’s well done then to the Rowlinson Connor garden office, which has a unique design, and is also exceptional value for money given its size and 10 year warranty period. 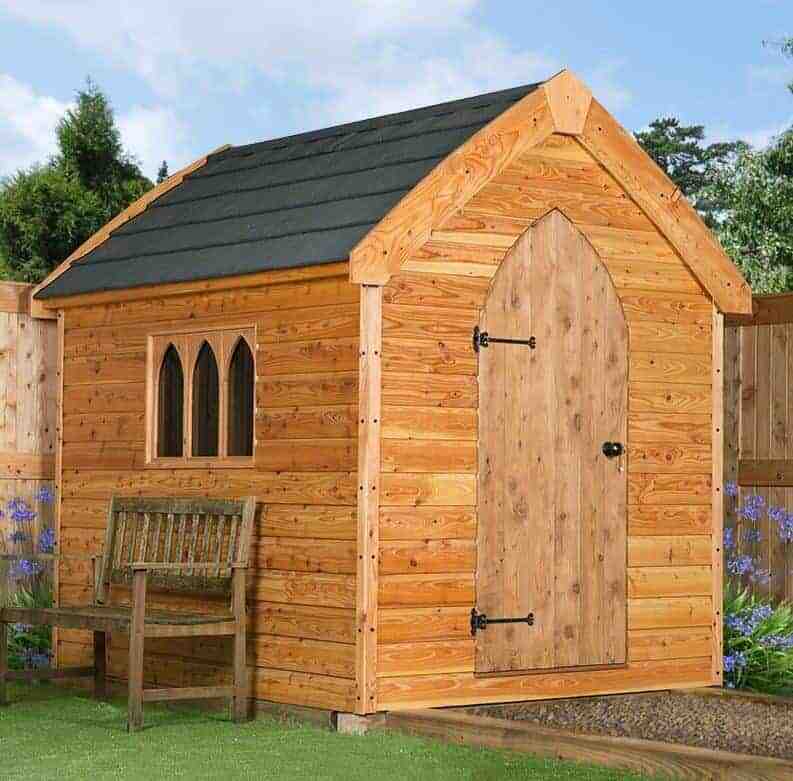 Whether you want an office, shed, playhouse or garage for your garden, WhatShed’s independent reviews can help you make a great purchasing choice. This large sixteen foot by eight foot garden office pod has a unique look that is very different to that of any other garden building in this top five league table. The emphasis here is very much on office rather than pod, but its open fronted section gives it a pod like feel that earns it a place within our guide. It’s also substantially cheaper than any other building here, and it’s potentially more durable too as it is the only pod to come with an extended guarantee of ten years. These qualities earn it the honour of being our table topper, especially as it provides added value as it’s supplied factory painted. We found it a very eye catching building, and the enclosed office space on the left hand side next to the open fronted area on the right creates a really contemporary look. It also means that there is lots of natural light inside the building, which is an essential property for the creation of a good working environment. This is helped by the large hemispherical windows on both of the double doors, which we felt added even more visual appeal. We were also impressed by just how strong this garden office pod is, with 19mm tongue and groove cladding used throughout, and a 41mm frame which is substantially thicker than we usually see on wooden garden buildings. This is the smallest garden office pod in our league table, with a base area of approximately six foot by eight foot, and a peak height of 2.50m which is just over eight foot. That makes it ideal for people who want an office in their garden, but don’t have a lot of space on which to situate it, and there’s still more than enough room for one person to work comfortably in and to accommodate a computer desk and chair. Whilst this still costs significantly more than our table topper, it’s also cheaper than our other three models, and this relative value helps it claim second position within our guide. 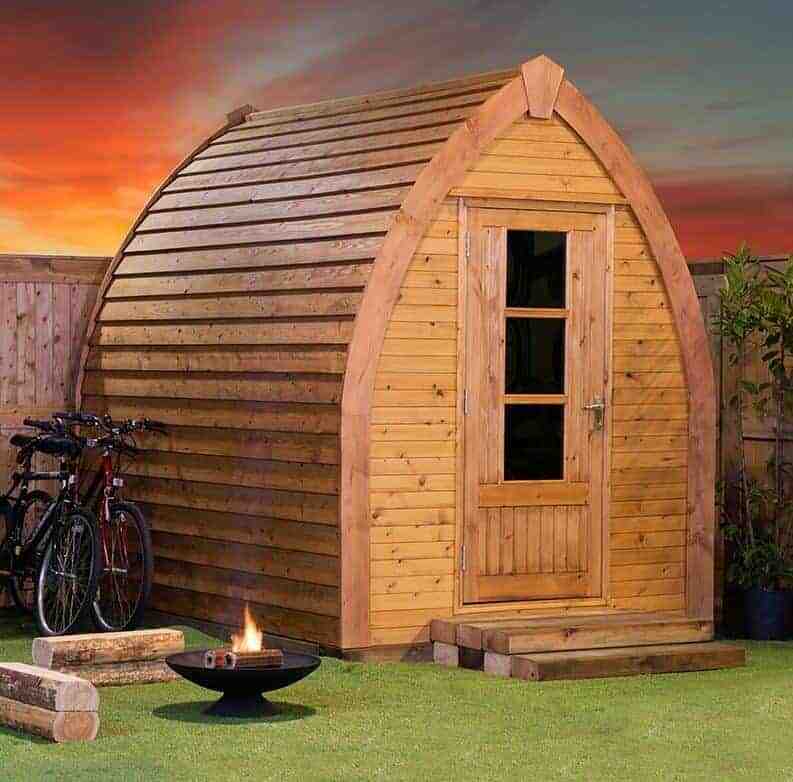 Style wise, this garden office pod is among the most attractive garden buildings we’ve reviewed, utilising the curved boarding that creates a pod shape which is a modern design classic. It’s also very tough, and feels stable and reliable once it’s been constructed. 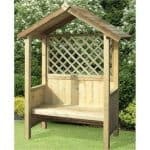 For that reason we feel it should be a smart choice for gardens that are in exposed and frequently wind swept areas. 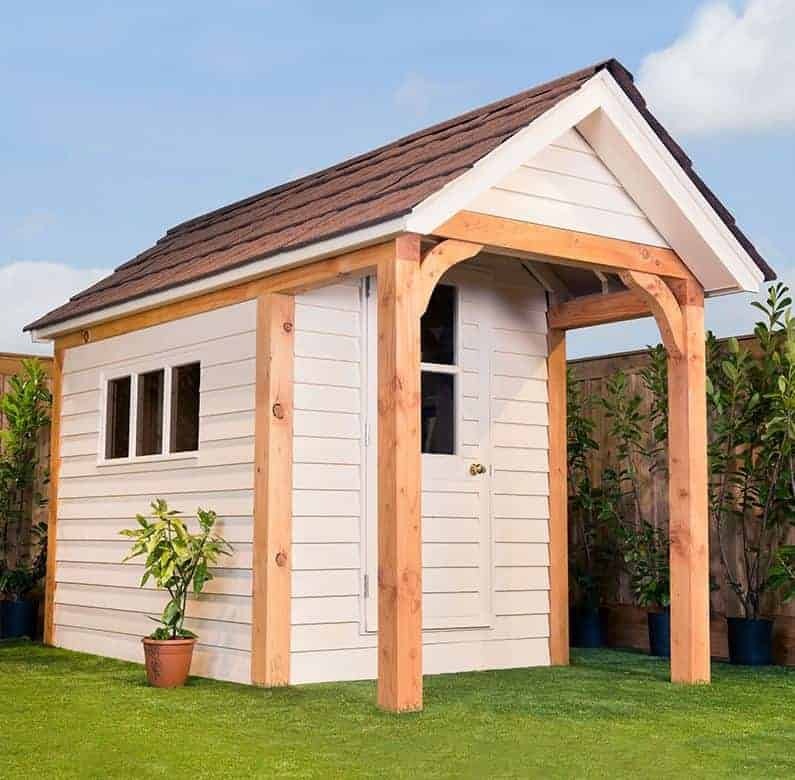 If you want a compact garden office that will really turn heads, then this should be at the top of your short list, although of course we would have liked to see an extended warranty included as well. A garden office pod has to fulfil two functions: it has to be a pleasant and useful area to work in, whether for business or leisure purposes, and it also has to have a stylish appearance that will make it a garden feature in its own right. 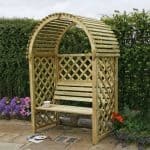 This building certainly ticks both boxes, and we feel its eight foot by eight foot base area is an ideal size for typical small to medium sized gardens. There’s enough room inside to install the furniture and computing equipment needed for an office, and yet it’s not so large that it will take up too much precious lawn space. 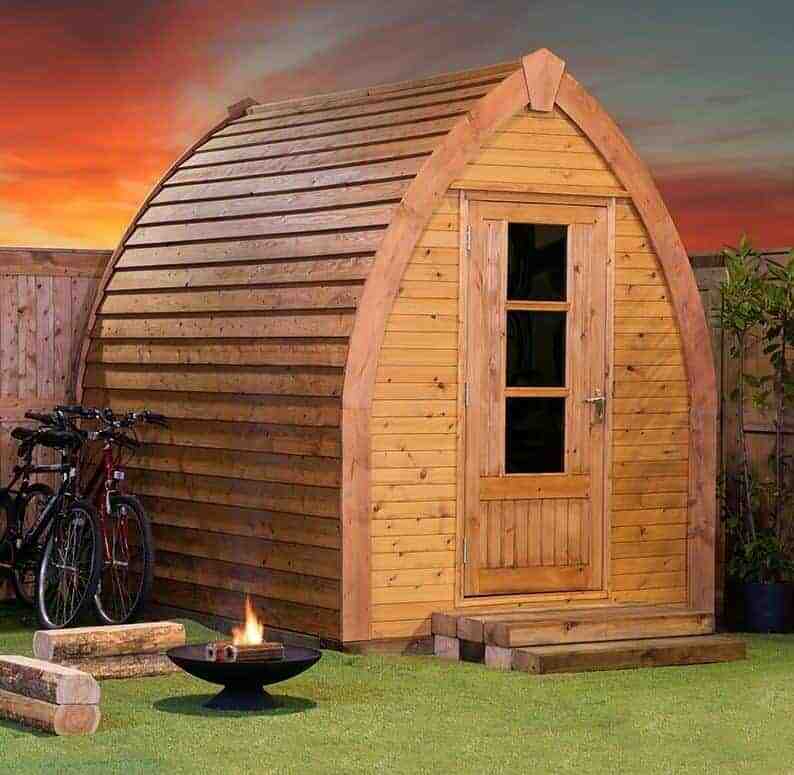 This is a garden office pod like no other that we’ve seen, other than the same building in its different sizes. Its design is based upon a gothic style church building, which we found fun and charming, and we especially liked the arched tops of the door and the three windows. We were pleased to find that these windows let enough light in to work by, and yet they still make it hard for passers by to see inside and ascertain whether anything of value is being kept inside. Security is further boosted by the inclusion of a key operated lock. We were also glad to discover that the brushed shiplap cladding has been lined with plywood, this keeps draughts out meaning that you can work inside a pleasantly warm environment even in colder months. 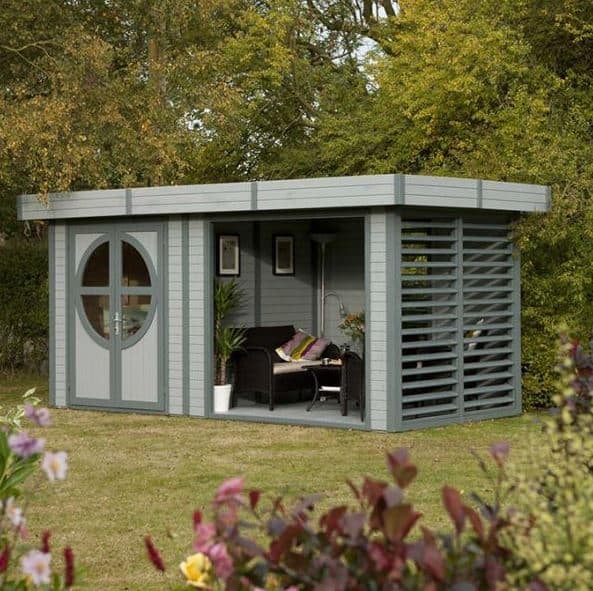 This six foot by eleven foot garden office pod is very different to the standard glass fronted garden offices that we often see, with an original design that to our mind has a very Scandinavian feel about it. It does, however, incorporate a lot of glazing, with three horizontally adjacent windows on a side panel, and two vertical windows on the single hinged door. This means that the interior is very well illuminated on a sunny day, creating optimal conditions to work in, and as the windows are made of perspex you won’t have to worry about them shattering or becoming damaged. The first thing that caught our eye when we saw this garden office pod was the large canopy created by the overhanging roof, and held up by two strong timber posts. 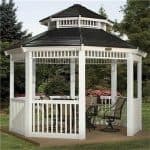 We found this visually pleasing but it’s practical too, as it creates a shaded area outside the entranceway as well as providing added weather protection. We also liked the use of metro tiles on the apex roof, creating a very stylish impression that’s reflective of this smart garden building as a whole. Of course, this style also brings with it a high price tag which accounts for it taking only the penultimate spot within our league table. This garden office pod shares a design with the BSW pod in second place within our league table, but with two important differences that earn it a place of its own in this WhatShed guide. Firstly, it’s much larger with a base area of approximately eight foot by twelve foot. 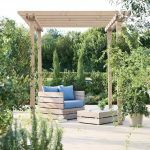 This means that it can be used not only as a garden office, but also as a spacious storage area or as a place to relax or entertain guests in before or after a dinner party. The other difference is that it has a double door, making it much easier to move the equipment you may need for your business in and out. We found a lot to like about this garden office pod, and it’s difficult to overemphasise how visually attractive it is with its curved sides creating the typical garden pod design. It’s also very tough, with 19mm thick cladding being used for the walls and 18mm thick cladding being used for the floor. That’s thicker than we usually see in garden buildings of this size, and means that you won’t need to reinforce the floor if you want to place furniture upon it. It has to be said, however, that the asking price of nearly seven a thousand pounds may put people off this original and well built garden office, which is why it occupies the final spot in our league table.